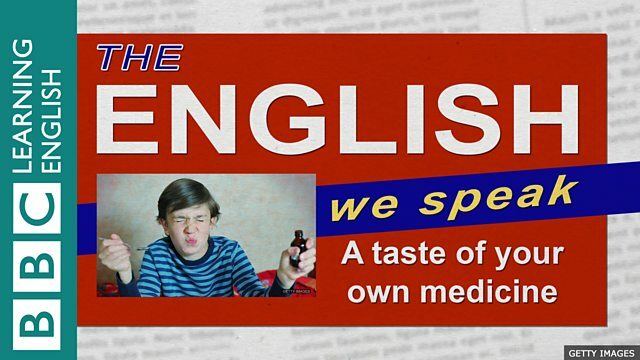 Nobody really likes taking medicine, especially when it tastes so horrible. That's why medicine is used in a phrase about receiving the same bad treatment that you have given to someone else. Neil's convinced Feifei's had a taste of her own medicine. Find out if he's right in this programme. … and I'm Neil. Hey Feifei, it sounds like you might have a cold? I think I have – sore throat, blocked nose. I feel terrible. That's why I'm taking this medicine. That's probably a good idea. Medicine is usually good for making you feel better but how does it taste? Well, it's supposed to taste of strawberries but to be honest it's just horrible! That's why I never take the stuff – it's disgusting. Have you heard the phrase 'a taste of your own medicine'? No. Does it mean doing something horrible or unpleasant? Sort of. It describes someone receiving the same, treatment or unpleasant experience that they have given to someone else. You know, like you're always bossing people around and then someone starts to boss you around? I don't know what you mean Neil! Anyway, it's quite a negative phrase. Our boss is so rude to us but finally somebody has answered back and now he's got a taste of his own medicine. When I meet up with my boyfriend, he's always late so this time I'm going to give him a taste of his own medicine and turn up late as well. Deepak is always rude to the teacher but he was really offended when she gave him a taste of his own medicine and was rude back to him! So that's 'a taste of your own medicine' which describes someone receiving the same treatment that they have given to somebody else. Excuse me! Oh dear. It sounds like you need to take some more medicine. If you mean literally taking the medicine, then yes. But if you mean receiving the same treatment I've given to someone else, then no. I can't believe you think I am always bossing people around. I was just giving an example of the phrase. I would never say you were bossy. Good. Now why don't you go and make me a nice up of tea? Oh, OK, yes sure. See you. And don't forget to close the door! Yes. Sorry, I'll do that right now. See you later. Ah, I feel better already. Bye.